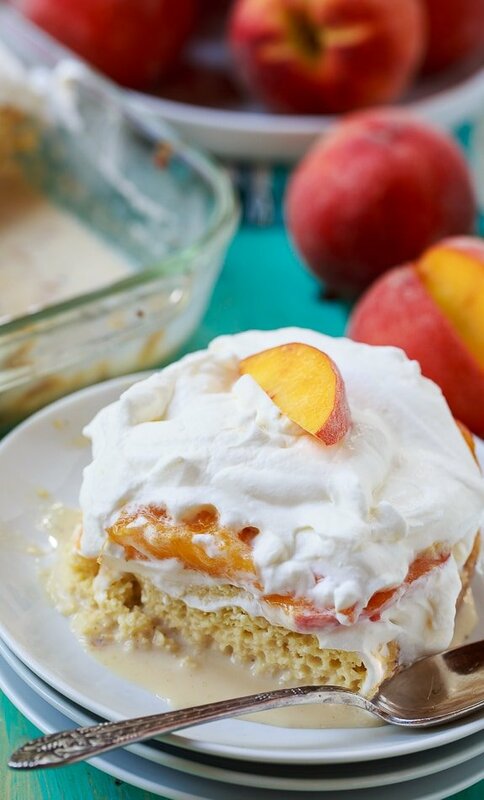 Peach Bourbon Tres Leches Cake makes a wonderful make ahead dessert for a summer get together. It is cool and creamy and fabulously rich with a layer of sliced fresh peaches and a little bourbon to add another flavor dimension. 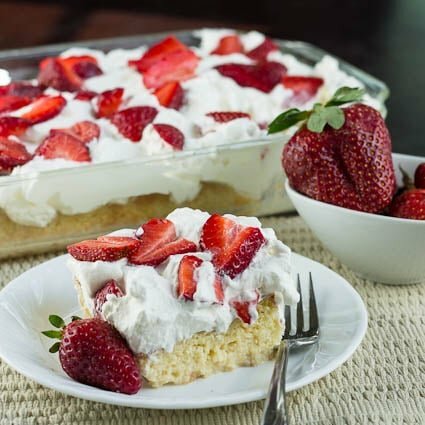 Three different kinds of milk- evaporated milk, sweetened condensed milk, and heavy cream, make this tres leches incredibly moist and rich. 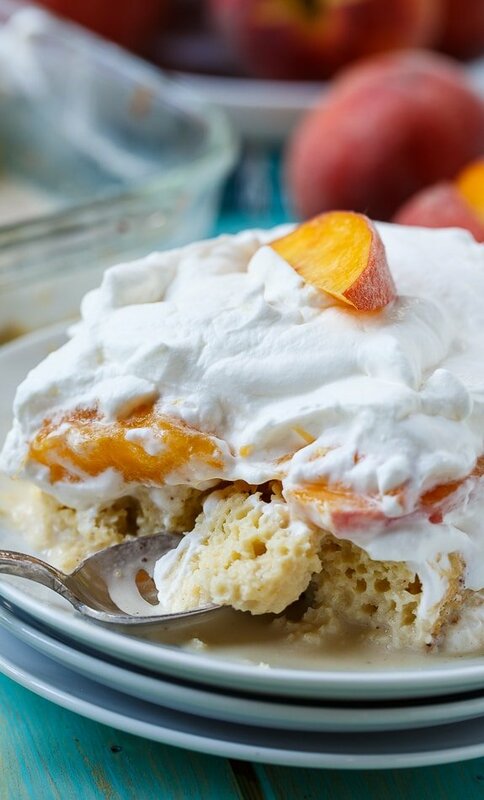 A bed of sliced fresh peaches lays on top of the cake and then a heavenly layer of whipped cream covers the peaches. There’s nothing not to love about peaches and cream. If you want even more peach flavor, you could use Peach Schnapps instead of bourbon. 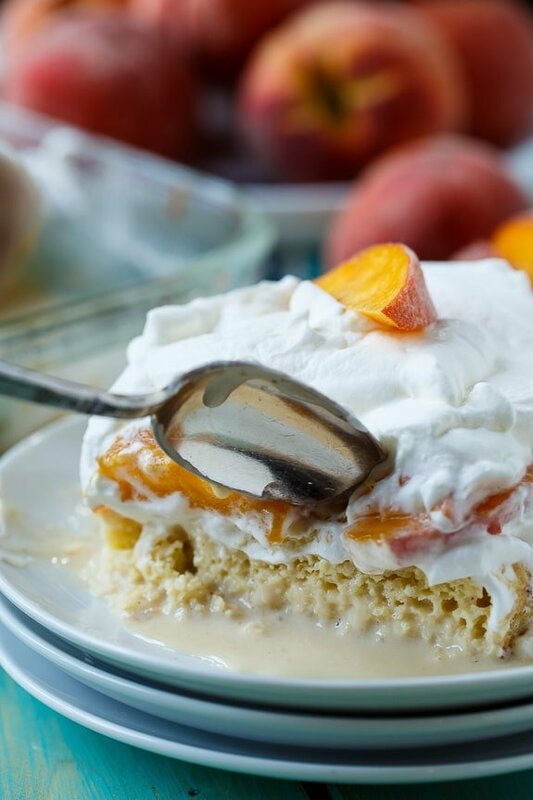 This Peach Bourbon Tres Leches Cake should be served chilled out of the refrigerator, making it an especially good dessert for a hot summer day. Preheat oven to 350 degrees. Butter a 9X13-inch pan. Line pan with parchment paper and lightly butter it. Separate eggs and with an electric mixer beat egg yolks with 3/4 cup sugar on medium speed until pale and creamy, about 2 minutes. Beat in milk and vanilla. Using a clean and dry mixing bowl and beaters, beat egg whites starting on low speed and increasing to high speed. Beat until they reach soft peaks, about 2 to 3 minutes. With mixer on high, add 1/4 cup sugar in a steady stream to the egg whites. Continue to beat until firm peaks form. Working in thirds, fold in 1/3 of flour mixture and then 1/3 of egg whites into egg yolk mixture using a rubber spatula. Repeat 2 times. Pour batter into prepared pan and bake 20 to 25 minutes. Let cool 5 minutes. Invert cake onto cooling rack, peel off parchment paper and let cool completely. Return cake to baking pan. In a medium bowl whisk together condensed milk, evaporated milk, 3/4 cup heavy whipping cream, bourbon, and cinnamon. Prick cake all over with a fork and slowly pour bourbon mixture over the top of the cake. Cover with plastic wrap and refrigerate at least 4 hours of overnight. Cover top of cake with peach slices, saving a few slices for garnish. To make whipped topping, beat heavy cream with an electric mixer at medium speed. When it begins to thicken, slowly add sugar. Continue to beat until it holds firm peaks. Spread on top of cake. Note: You will need to separate the eggs for this recipe. Eggs are easiest to separate when they are cold, but you need to beat egg whites at room temperature for best results. Once you separate them, be sure to let the egg whites sit at room temperature for at least 20 minutes. 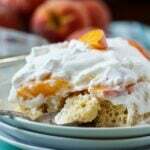 This entry was posted in Cakes, Desserts and tagged cake, peach, peaches, tres leches. Bookmark the permalink. What about using canned peaches ? Yes, you should be able to use canned peaches that have been drained well. YUM. This is just how a good tres lesches should be.. sweet and swimming in sweet milk! You make the best desserts! I can’t get enough of peaches lately and with bourbon and in a tres leches cake? What a wonderful treat! It looks amazing!! Oh talk about delicious! This is my kinda of dessert. It looks wonderful Christin! The touch of cinnamon would be just lovely. I’m loving the addition of bourbon and peaches. It’s a fantastic way to kick up a tres leches cake. Peaches and bourbon are soooo good together! And I love the idea of using them with tres leches cake! This looks incredible! This cake is just stunning, Christin! 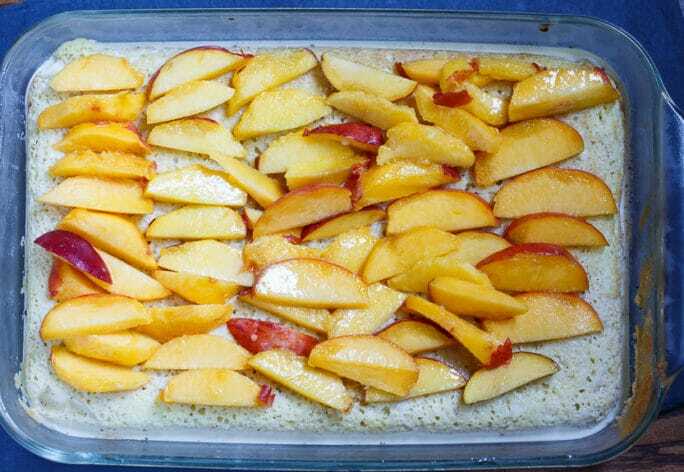 I can never resist peach desserts, so I just want to dive right into this. Sounds absolutely delicious, especially with the touch of bourbon! 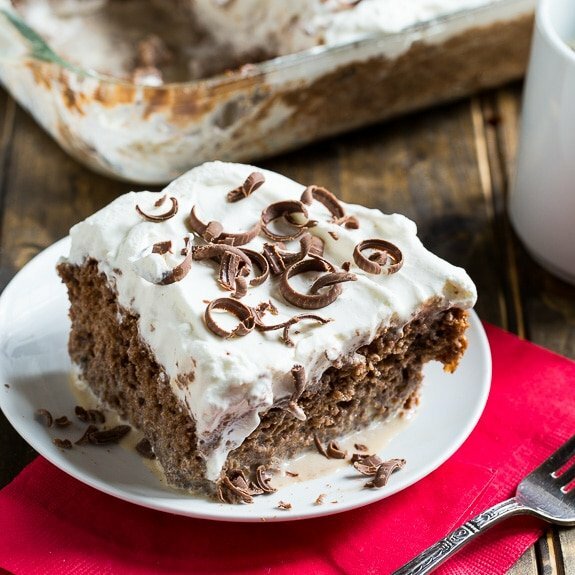 Oh this is so much better than regular tres leches cake! Gorgeous! I seriously adore anything peaches and cream 🙂 Also, I have been curious about tres leches for a while, but have never tried this. Now on my to-do list!